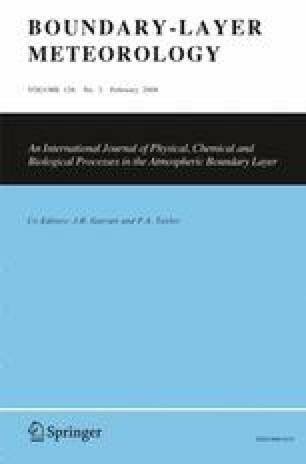 Spectra of CO2 and water vapour fluctuations from measurements made in the marine atmospheric surface layer have been analyzed. A normalization of spectra based on Monin–Obukhov similarity theory, originally developed for wind speed and temperature, has been successfully extended also to CO2 and humidity spectra. The normalized CO2 spectra were observed to have somewhat larger contributions from low frequencies compared to humidity spectra during unstable stratification. However, overall, the CO2 and humidity spectra showed good agreement as did the cospectra of vertical velocity with water vapour and CO2 respectively. During stable stratification the spectra and cospectra displayed a well-defined spectral gap separating the mesoscale and small-scale turbulent fluctuations. Two-dimensional turbulence was suggested as a possible source for the mesoscale fluctuations, which in combination with wave activity in the vertical wind is likely to explain the increase in the cospectral energy for the corresponding frequency range. Prior to the analysis the turbulence time series of the density measurements were converted to time series of mixing ratios relative to dry air. Some differences were observed when the spectra based on the original density measurements were compared to the spectra based on the mixing ratio time series. It is thus recommended to always convert the density time series to mixing ratio before performing spectral analysis.